Dressed in long pants, long-sleeved shirts and hiking shoes, with hats to protect us from the afternoon sun and walking sticks to steady our steps, we followed a deer path to the dry creek bed that crosses from east to west at the south end of our property. We entered the creek bed and walked along its rocky path to where it runs into a rock outcrop and then turns and heads south. At that turn, just as we thought, water had seeped up from the ground and had formed a clear pool. We slipped off our shoes and socks and disrobed. Believing there would be water, we had worn swimming suits. We waded into the pool, sat on submerged rocks and let the cool, still water top our shoulders. We absorbed the environment as it absolved us. Memories from that day are colored by dragonflies. Drawn to the same still water and bright sunlight that we were, they hovered to study us as we studied them. They flew in every direction — forward, backward, up and down and side to side, each movement swift and precise. Born of water, then taken into the air on transparent wings, dragonflies have been here for millions of years. They cause us no harm. They do not bite nor sting. Fascinated by their distinct shapes, unique colors and aerial antics we have attributed these insects with folkloric or mythic qualities. Certain Native American tribes believe the dragonfly is a messenger, associated with the permanence and purity of water. The insect symbolizes transformation, renewal and rebirth. Patterns of belief shared by a society carry seeds of truth. I find it is easy to accept these timeless tales. The appearance of dragonflies in the desert is significant. The first time we walked the creek bed, we were with our contractor. We were hiking the land to see what all it had to offer. We knew where we wanted the house and studio located, so we went exploring to see if our idea was feasible. As we hiked the land, the contractor seemed impressed — a positive comment here, a positive comment there. When we hit the creek bed and followed it to the property line, he asked a rhetorical question and then answered it. "Do you know what you have here? You have a good piece of land." Most of the time, the creek bed has been bone dry. Sometimes it has cradled a pleasant, mild-mannered stream. At other times white water has roared over its banks, reminding us that "there are two easy ways to die in the desert: thirst and drowning." The creek attracts wildlife. Animals come. Animals go. 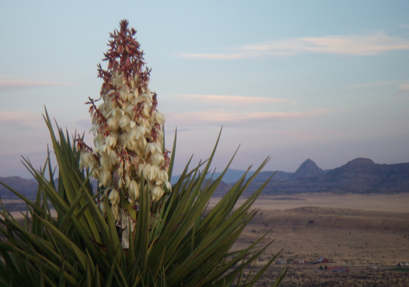 Over the years we have seen deer, javelina, jackrabbits, coyote, fox, skunks, one bob cat and many species of birds. We joke about living in a wild animal park. But it's dragonflies that tell us when standing water is nearby. They never lie, nor do they exaggerate. When we see them darting around the property, we consider it a good omen. We know we have been blessed. Postscript: Last night, more than an inch of rain fell in the desert. This morning, there were clouds of insects. We watched as dragonflies, flying in every direction at great speeds, cleared the air.